Here are a number of photos taken at David Beaton and Sons in West Mantoloking, NJ. It is where Sjogin is berthed and cared for. 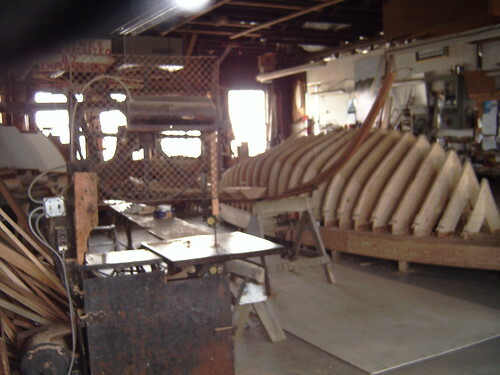 It’s an old family boatyard founded in the 30’s by David Beaton. His grandson and my friend Tom, along with the Beaton family, run the yard. One of these days they’ll have a new web site. In the meantime check back on the main page for current Beaton’s doings. 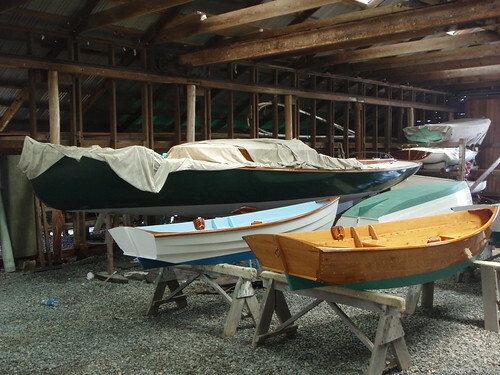 This past winter, Tom had the yard build five rowboats, copying a design of his grandfathers. Here’s a view of two of the new rowboats; the bottom-up one is the original, built in the 60’s as a grandparent-grand kid boat. That’s Ghost in the background. Beaton’s Fresh and ready to rumble. This will be her 15th season racing on Barnegat Bay. 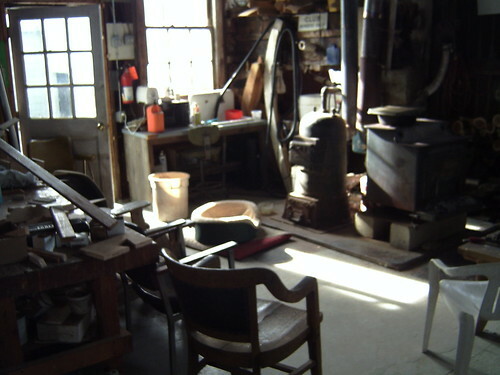 The wood shop at Beaton’s. Generations worth of skill, tools and passion. Charlotte being taken to her mooring. Built by Beaton’s in 2003. A-Cats south of Swan Point. Five of these were built by Beaton’s in the past 25 years. 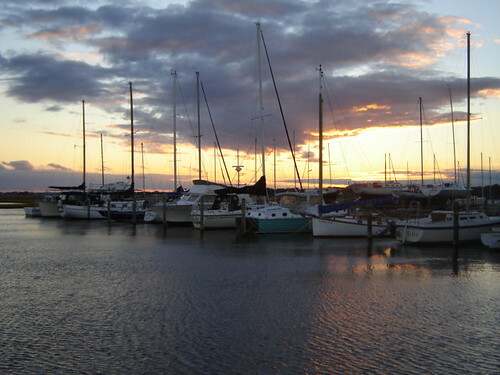 Part of the fleet at sunset in late October. 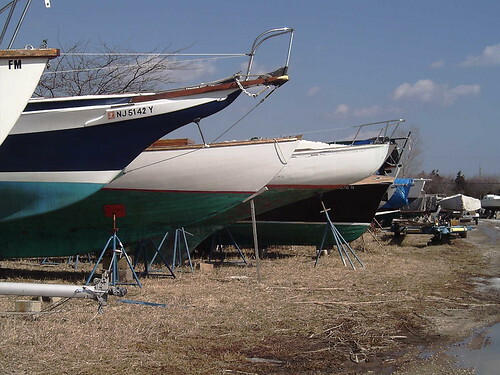 Here are three A-Class Catboats waiting to be rigged for the 2005 season. See the Boat Links on the Home Page for a lot more. 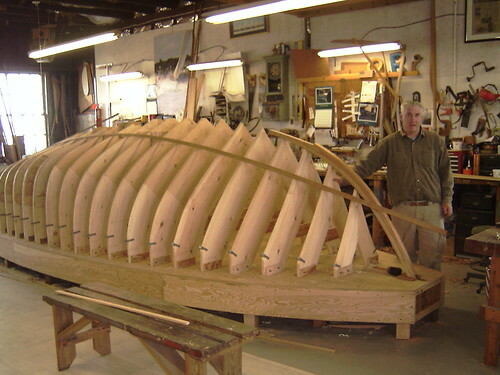 This is Tom Beaton, third generation owner of David Beaton and Sons, standing by the jig for the Joel White/Herreshoff Flatfish Daysailers they now build. 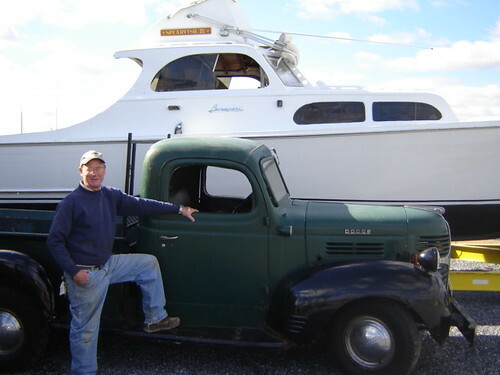 Here’s one of the Beaton Irregulars striking a Captain Morgan pose next to his truck and 1955 Pacemaker. 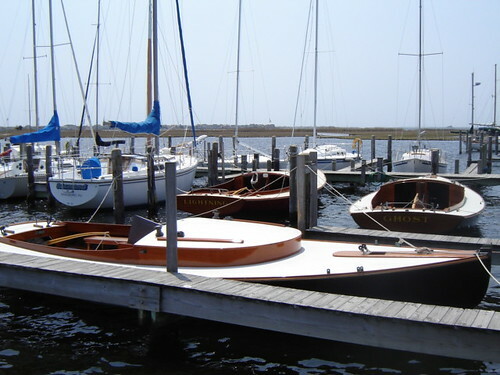 An L. F. Herreshoff H-28. The bow of the A-Cat Lightning in the background. The wood stove and steam box boiler in the wood shop. My name is Sean Park and I am the Commodore of the Herreshoff S-Class of Western Long Island Sound (see our website http://www.herreshoff-s-wlis.org). We have 9 boats actively racing out of Larchmont. I am enquiring about the S-boat photo on your site. Do you know if the name of the boat is “Volunteer”? And has she been abandoned? I may be interested in moving her to a dry location and restoring her. She used to be in our fleet, but the owner disappeared. My name is Matt Schofield and I also have an interest in this hull. My father owned her as “Ahab” from 1962-1968 and I have been interested in acquiring her. I would hope to sail her on Buzzards Bay. please let me know her status. Seeing these pictures really brings back memories. For years in the ’50s we wintered our sneak box “Frozen Assets” at Beaton’s, the place of her berth. Happy to provide the walk down memory lane. Are you sill in the area? I used to work there back in the 80’s. Scraping and painting. My father worked on his Sparkman there. “Magic” was her name. He found her across the street in Winters boneyard and restored her. all the finishing touches were done at Beatons. And I think Tommy beaton used to crew on her when he would race in the Metedeconk. Its good to see some things staying the same. I had the pleasure of crewing on Magic with Doc, Tom, and Mark Dawson in ’85 I think it was. I had a boat there at Beaton’s that I had purchased in Brighton, England. I remember getting the boat to a Beaton’s mooring about 5 days before hurricane Gloria. My boat, a 35′ French built masthead sloop, had a red hull, and it stayed at Beaton’s for a few years in the ’80’s. I vaguely remember a triskedecaphobia party that I could’nt attend, and a discussion of the concept of “perseveration” which I seemed to be engaged in. I got a billet on a foreign ship out of Miami one winter and only got back to visit every so often….fond memories. 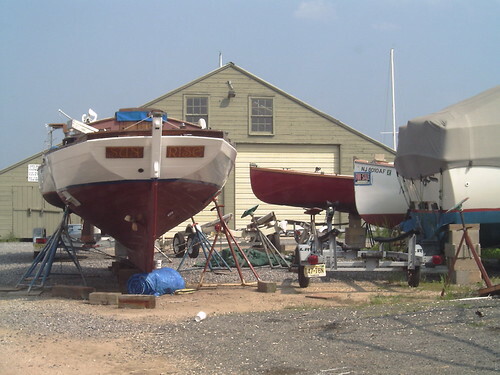 I grew up summering at Beaton’s Boat Yard. 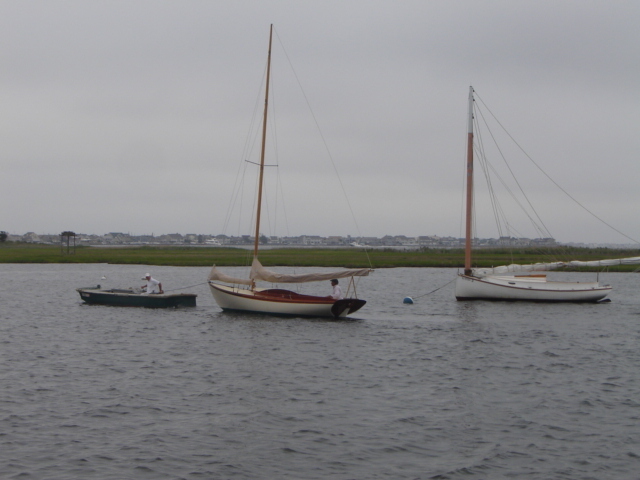 I bought my first sailboat, a Snipe, from three school teacher’s who sailed it from Beaton’s for several season’s. I had a friend, John Callahan, who introduced me to Beaton’s. He sailed the Snipe, then purchased a G sloop. We had many fabulous sails from Beaton’s over several year’s. We were given a lightning owned by Mr. Beaton on one occation in Mid December. We sailed on the calmest bay with a light breaze that day. It was surreal. Not a single other boat on the bay that day as far as I could see. There were very old boats rotting in the weeds which we played skipper on for hours and admired the old brass fittings and large wooden cleats and pulleys. A lot has changed since I last saw Beaton’s 35 or 40 years ago, but I still get the same warm feeling when I saw it again today. Please don’t change it. And thank you for being a part of my growing up. Thanks so much for sharing your memories. While the Beaton family makes regular improvements to the yard, its soul will remain the same. When I first had a boat there in the late 70’s my kids had similar experiences playing on the abandoned boats on “Death Row”. Stop by sometime and renew your memories. During the ’50’s my family lived in a small cottage on Barnegat Boulevard, Bay Head Estates which my father and uncle purchased for $750 (!) in 1940 or so. We had a Comet and then a Lightning to sail on the bay. Fishing & crabbing provided local seafood and irregular visits to David Beaton & Sons in the ’38 Pontiac are a fond memory. Mostly I remember the smell of the wood stove and Balkan pipe tobacco which permeated the establishment. I also remember stepping up into the paint shop which seemed to have about a foot of drippings preserving the original, invisible wood floor. I new your father, Jim O’Dea from my youth years at Beaton’s in the 60’s. My father left his camera at the yard on one occation. Jim O’Dea tracked my father down and returned the camera. I learned a life lesson from that. He was a great man to talk with and I always looked forward to his spirited conversation. I remember many of my younger years at Beaton’s with my dad, Ron Tolles and my siblings!! Some of the best years of my life! Thanks Marta. Beaton’s still has that timeless quality. Stop by when you’re in the area and say hi. As a youngster growing up in Point Pleasant Beach, I was fortunate that my father decided to have Dave Beaton build us a racing sneakbox in 1956. We would visit there all the time and I loved to climb around the old boats and inhale the pervasive smell of cedar. I don’t think Dave ever had a production schedule, so a new boat might be ready in only 2 years (if you pestered him). 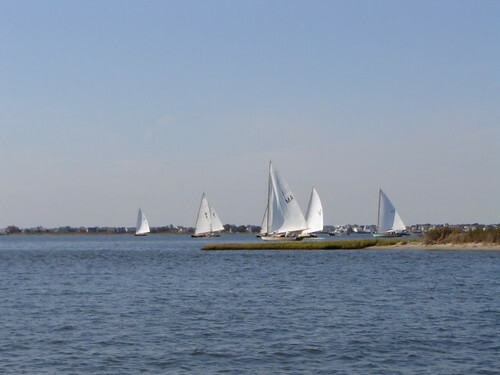 For a while in the 60’s and 70’s there were regularly fleets of 30 to 50 racing in the Barnegat Bay Yacht Racing Association (www.bbyra.org), mostly represented by the Toms River, Seaside Park, Beachwood, Manoloking, Manasquan River, and Lavalette Yacht Clubs. I last won the Bay Head Invitational with 3/3 firsts in 1983 with an old Ratsey & Lapthorne sail that we broke out in heavy winds. Nice to see a yard that has stayed in business on the same site. My childhood and teenage yard,Hogan’s Boatyard, on Main St. in Tiburon, Calif. is now a Hotel. In the late summer of 1965 I brought my Lightning, #5697, built by Jules Hansen, Jamaica Bay, NY, to Beaton’s for new deck canvas and rub rails and for longterm storage. I was leaving for US Navy OCS in Newport and ultimately served in the aircraft carriers ESSEX and TICONDEROGA. When I returned in the spring of 1969 to retrieve “Bluebird,” Beaton’s refused to bill me for inside storage. As a Vietnam Vet who was returning to graduate school on the GI Bill, I have never forgotten–more than a half-century past–this act of kindness and generosity towards me by Beaton’s. I rather doubt that any third party, except for a reader her now, ever knew about this. That is the kind of people the Beatons are–exceptionally fine people of noble character. Bluebird never returned to Beaton’s. My cousin sailed her for a season off Rowayton, CT, in Long Island Sound, before she was sold.